It’s a satirical piece that dared to target both the presidency and our capacity to commercialize almost anything. And if you think torture could never be commercialized, just remember that Jesus Christ got similar treatment and the Church has been selling trinkets of it ever since (many of them sado-masochistic nudes!) You can see the complete installation of this project at www.americathegiftshop.com. The original image of the Iraqi torture victim is an example of the potency of single photographs to scorch our memory – perhaps the word ‘brand’ would be more accurate. It was so deeply shocking that you can never forget it, like the shots of the Twin Towers. What is it about the phenomenology of the photograph that it burns us so deeply, in ways that paintings do not? 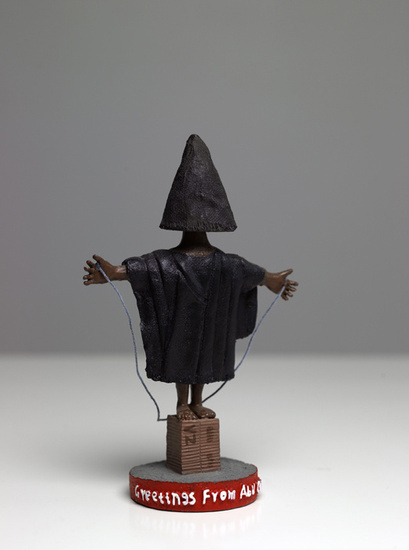 The figurine also is an example of photography metamorphosing into sculpture, of the 2D extruding itself into 3D. It is a curious instance of species cross-breeding, the giant sculpture of the Iwo Jima soldiers raising the flag is a further example. Normally a particular medium, photography, sculpture or painting, is distinct and the attributes of one are not found in another. But a sculpture made out of a photograph? It’s a strange and magical thing, like a fish with feathers or a chicken with gills. Jamie Beck & Kevin Burg are two New York artists working in the field of fashion photography, she is a photographer, he is a digital media specialist. The combination of their talents has produced a series of startling images, fashion stills that move. They have branded this technique ‘Cinemagraph,’ cinema-photograph. The couple create images that are conceived as still photographs but captured as video (the above image contains 35 frames). Post-production eliminates all but a few traces of recorded motion, then the file is saved using the .gif format. At least I think that’s what they do. The Turnstyle blog interviewd them about their work: An animated .gif is usually a sequence of stills pulled from video, animated art, or other imagery that is repurposed into a .gif. What we do is different because it’s a traditional still photograph with a moment living within it. We wanted to tell more of a story than a single still frame photograph, but didn’t want the high maintenance aspect of a video. In preparation for Fashion Week we were trying to figure out a way to show more about what it was like being there, so cinemagraphs were born out of a need to tell a story in a fast digital age. This is a new thing in photography and you can see more of it on their sites: cinemagraphs.com and fromme-toyou.tumblr.com. C-B disowned the phrase in later years but it usefully captures an important aspect of his practice. 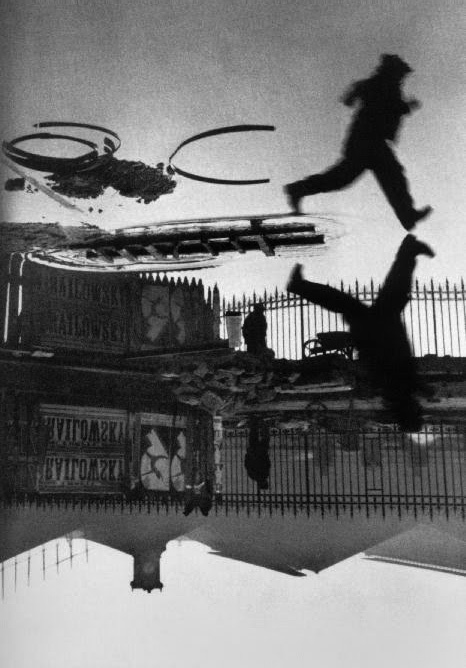 It’s about the medium’s genetic link to the subject of time and hence timing, and you can see how his timing worked in this photograph from the book, Behind the Gare Saint-Lazare, Paris, 1932. Aiming his camera through a hole in a fence, he caught this little ballet, a man jumping a puddle and his reflection, corresponding shapes on the ground, a circus poster in the background which echoes it all. It’s the earliest ‘serious’ photograph I can recall seeing, at about 15, and it helped propel me into a lifetime of photography. The focal point of this photograph is the man and his reflection, specifically the foot about to touch the water. 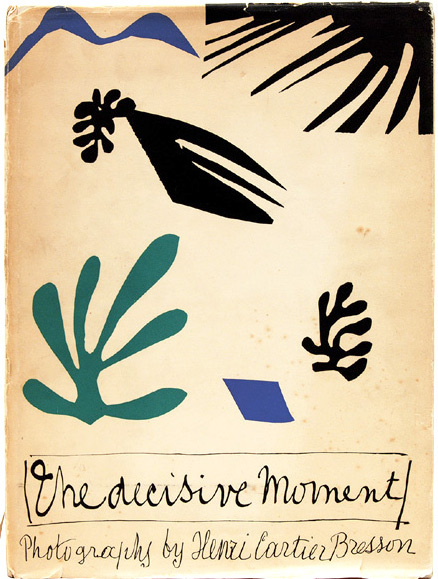 More specifically, it’s that gap between the foot and its reflection, the suspense created by the absence of closure. I’ve Photoshopped the feet to eliminate the gap so the foot has touched its reflection. The tension has gone, and so has the particular thrill of this image. 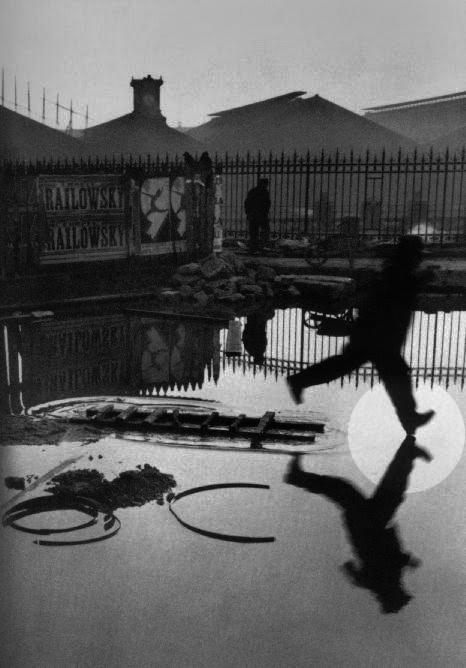 Magnum photographer John Loengard photographed the actual negative of Cartier-Bresson’s famous image, “Behind the Gare St Lazare, 1932”. It reveals some fascinating secrets about this picture. Inverting the image in Photoshop shows how it would look in a contact print. 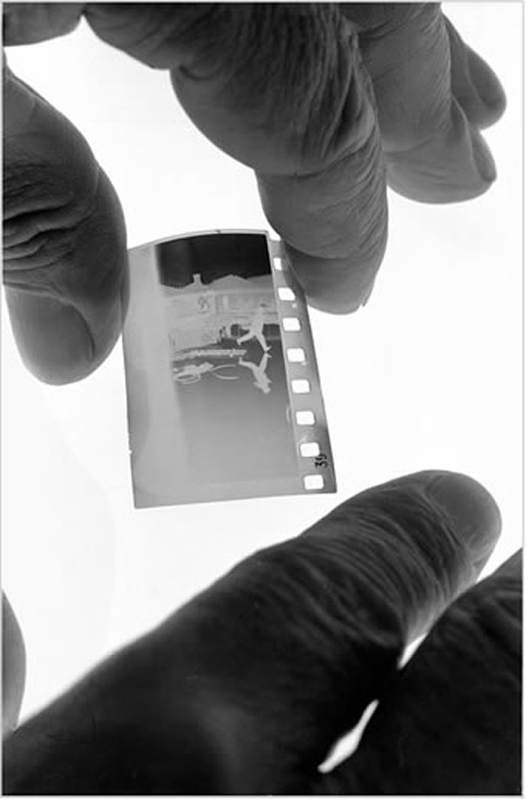 It appears to be a bit under-exposed, although it is nitrate film so it might behave differently in a darkroom. In 1939, Cartier-Bresson destroyed a lot of his early work, including negatives, and that explains why this is only a single frame. Curiously, the negative has sprocket holes on only one side. 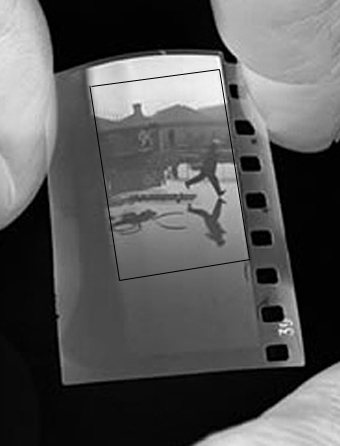 The photographer did not like to crop his negatives: “It very rarely happens that a photograph that was feebly composed can be saved by reconstruction of its composition under the enlarger; the integrity of vision is no longer there.” But this negative was cropped to make the famous image: his lens has included an iron rail on the left, and more water and sky than he wanted. Despite his statement, he cropped out about half of the negative area. Well, he was only 24 when he shot it. 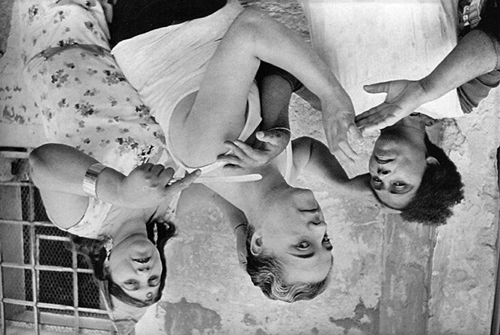 Henri Cartier-Bresson had a famous habit of turning photographs upside-down and sideways to test the strength of their composition. 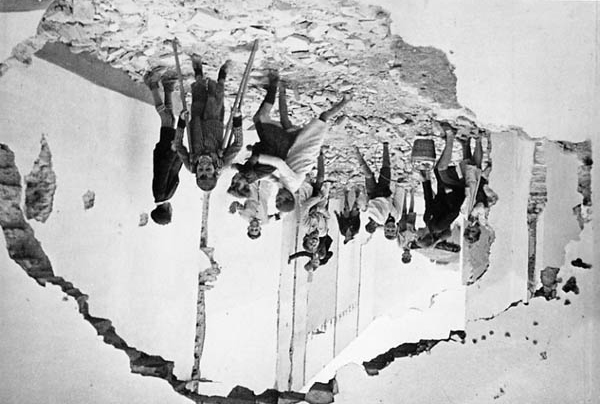 If a picture still worked upside-down, there must be some validity to its design. If an upside-down picture doesn’t work, then it must be relying too much on its subject-matter. It would just be a record of something and not a made work of art. Let’s put his own images to the test and see if they pass. They did pass, didn’t they? 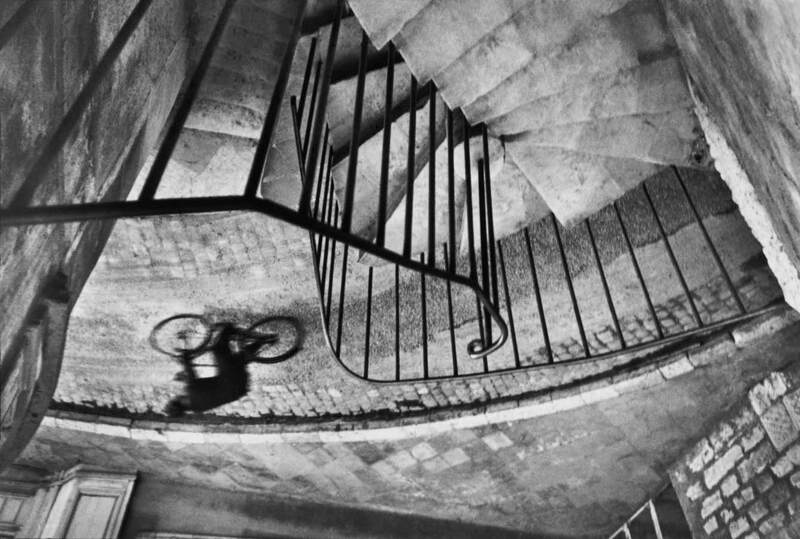 Cartier-Bresson’s famous photograph was shot behind the Gare St Lazare, the large railway station in the north of the city. He was shooting through an iron fence, across a flooded yard, with the rear of the station in the background. I’ve figured out the location of this shot, and can even find the fence that C-B pointed his camera through – it’s still there. Using Google Earth and Google Street View, I can take you to the sacred spot! 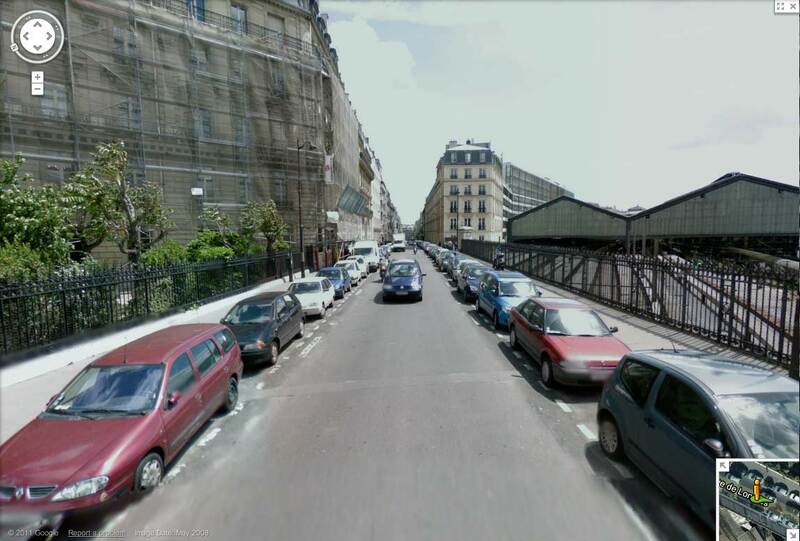 Google Street View in the Rue de Liége. Cartier-Bresson was shooting through this fence, at about this point. 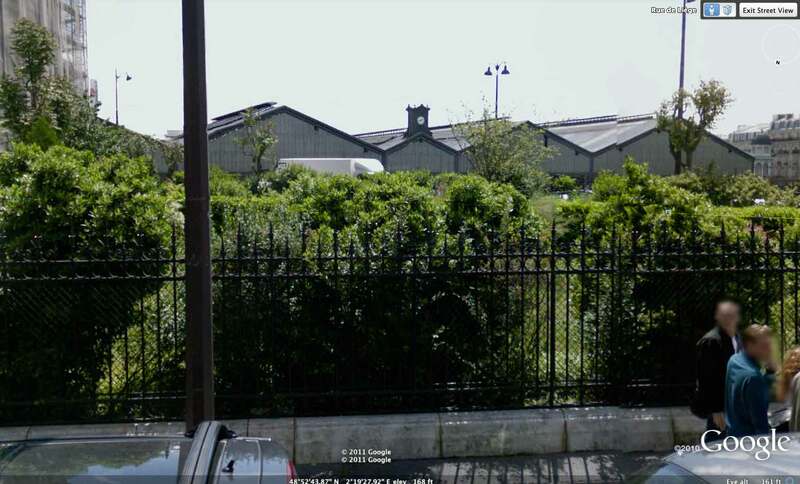 Google image of Rue de Londres the far side of the park, facing the back of the station which can be seen on the right. In the Cartier-Bresson image, a dark figure can be seen in the background, walking along the footpath on the left. 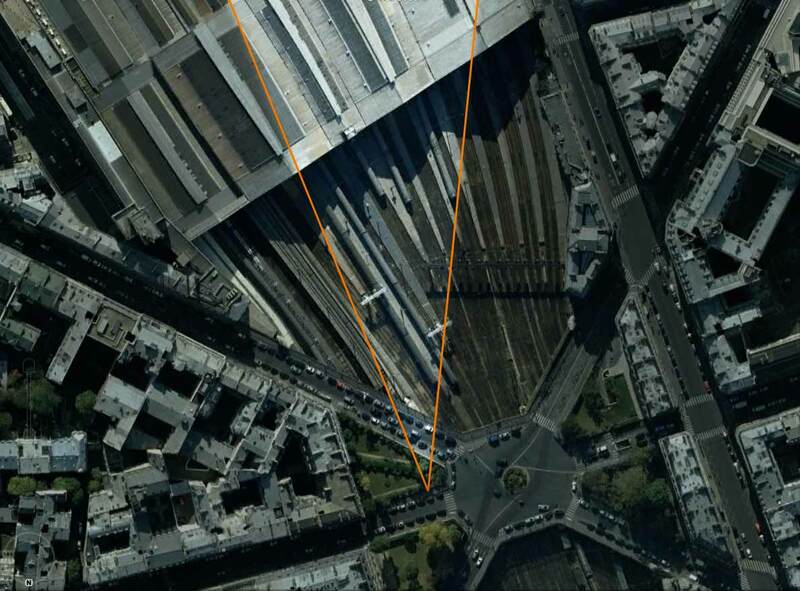 Google Earth image showing the position and angle of view of Cartier-Bresson’s lens, aiming across what is now a park, towards the rear of the Gare St Lazare. 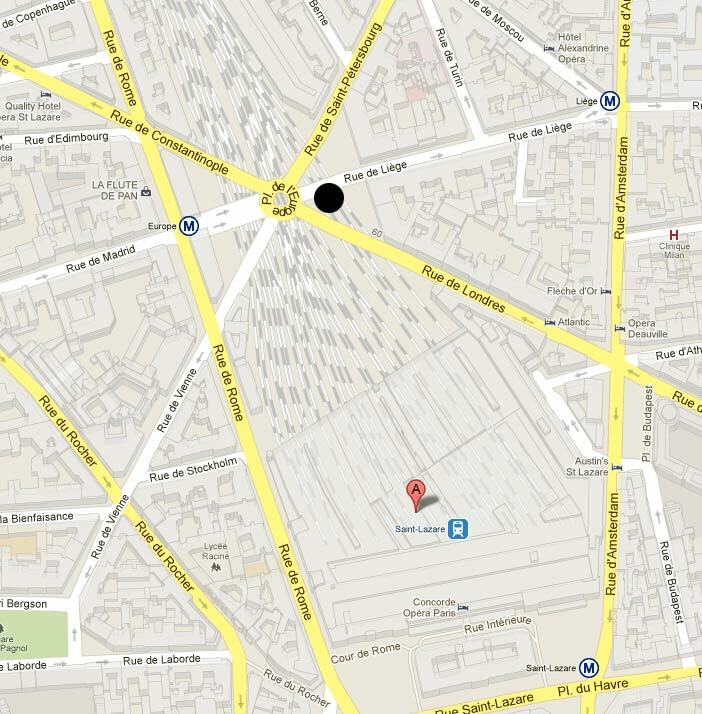 Google Map of central Paris, showing the location of the shot.